A Singapore Airlines Ltd (SIA) flight to Milan caught fire early on Monday after returning to Singapore’s Changi airport following an engine oil warning message, but all passengers were safe, the airline and airport officials said. 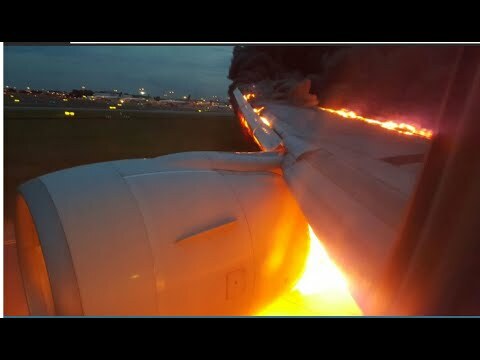 The aircraft’s right engine caught fire after the aircraft, a Boeing 777-300ER, touched down at Changi airport at around 6:50 am (2250 GMT). Emergency services put out the fire and there were no injuries to the 222 passengers and 19 crew on board, a SIA statement said. “Passengers disembarked through stairs and were transported to the terminal building by bus. Passengers will be transferred to another aircraft which is expected to depart for Milan later today,” the statement said. Social media images and videos showed the 10-year-old aircraft’s right wing on fire as it stood on the runway after landing, and fire engines racing to it. There appeared to be damage to the right wing and GE90 engine, which was manufactured by General Electric. The aircraft’s pilots “followed the right procedures” by turning back once the problem was detected, dumping fuel on the way, and landing safely, said one analyst. “When the plane slows down as you land, fuel can cling to the wing and surfaces. Sparks from the hot brakes after they landed could have the triggered the fire and it does appear quite dramatic. But they appear to have gotten that under control very quickly,” said Greg Waldron, Asia Managing Editor at Flightglobal, an industry publication. SIA, which is widely recognized as one of world’s leading airlines and is a benchmark for much of the industry, has not had any major incidents in recent years. Its only accident resulting in casualties was a flight from Singapore to Los Angeles via Taipei, where it crashed on Oct. 31, 2000 into construction equipment on the Taiwan Taoyuan International Airport after attempting to take off from the wrong runway. The crash killed 83 of the 179 people on board.